As defined by Eyebrowthreading.com, threading is an old method of hair removal where the process involves a technique that uses 100% cotton thread. The cotton thread is twisted and rolled along the surface of the skin entwining the hairs in the thread, which are then lifted quickly from the follicle. It is more precise than waxing and allows for better lines. 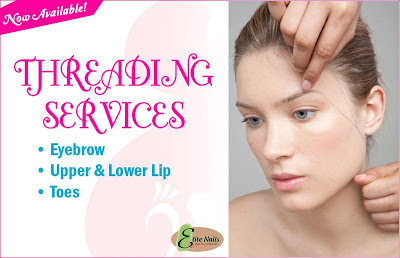 What's actually good about threading, for eyebrow threading as example, is that, it gives your face a natural aura because the process of shaping and taming your eyebrows is done and follows the shape of your face as well. There's a bit of ouch factor but it’s definitely worth the result after. This is so far the easiest, neat and cheapest way to give grooming to your eyebrows. Try this new service available now at Elite Nails Spa and achieve naturally-shaped eye brows and neatly trimmed lip and toe hair in just minutes!